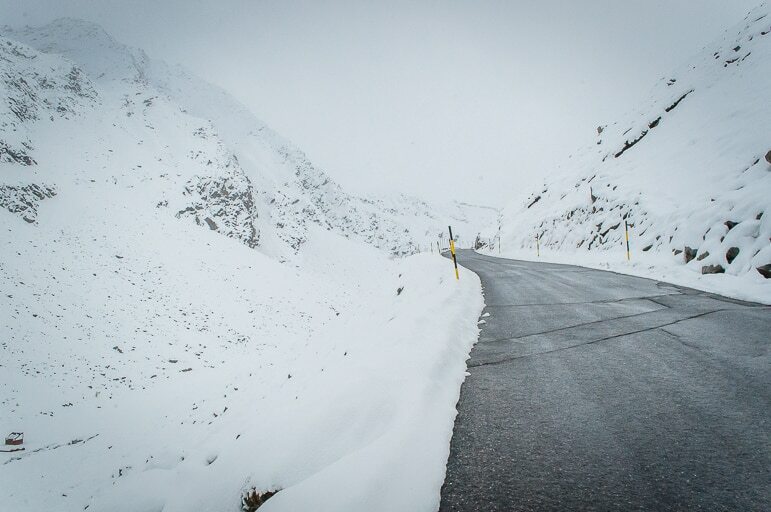 As our car steadily climbed ever higher, the temperatures dipped and the scenery gradually became whiter and whiter as we headed to Sölden. Winter is coming to Austria. The colourful autumn landscape of red and gold set against a piercing blue sky greeted us as we stepped off the train in Otztal, in the Tirol region. 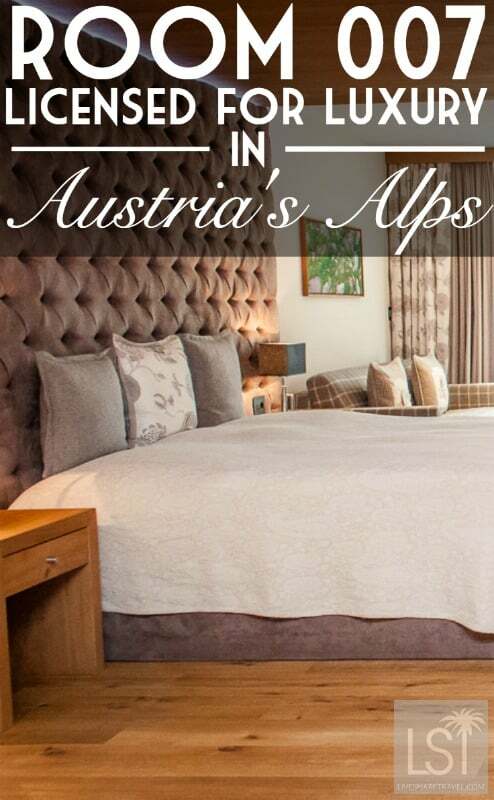 From here we began our scenic drive up to the internationally renowned ski town of Sölden at 1,400 metres, to stay at the luxury five-star Das Central hotel, one of Austria’s Finest Experience Hotels. Set well back off the main road, Das Central enjoys a quiet location. All around the hotel we looked out onto views of the snow-capped mountains. As the Alpine winter deepens the snow will creep further down the hillside, eventually covering the town itself. And this being Austria, the locals are longing for the snow to arrive. 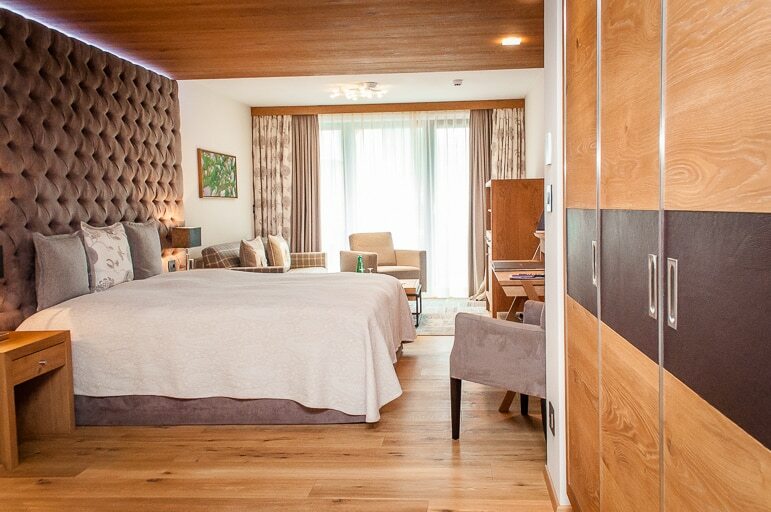 The 125-room Das Central has recently finished an extensive renovation and extension programme, as well as a major refurbishment of many rooms. The improvements were noticeable as we entered the new spacious reception area. I think most returning customers will be delighted with the changes, which while being very modern are also homily and welcoming. Checking into room 114 we were impressed. It was large and very contemporary, with a Samsung tablet, large flatscreen TV, and quite futuristic controls for the lighting and air conditioning. There was a king-sized bed, comfortable sofa and armchairs, coffee table, plenty of storage, a well-stocked mini bar and balcony looking out onto that mountain view. 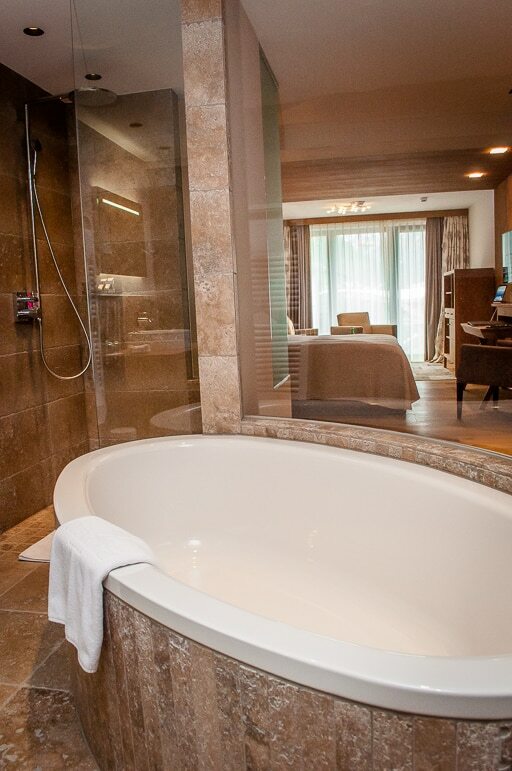 There was also a beautiful, big bathroom with a double-ended bath and separate rain shower. 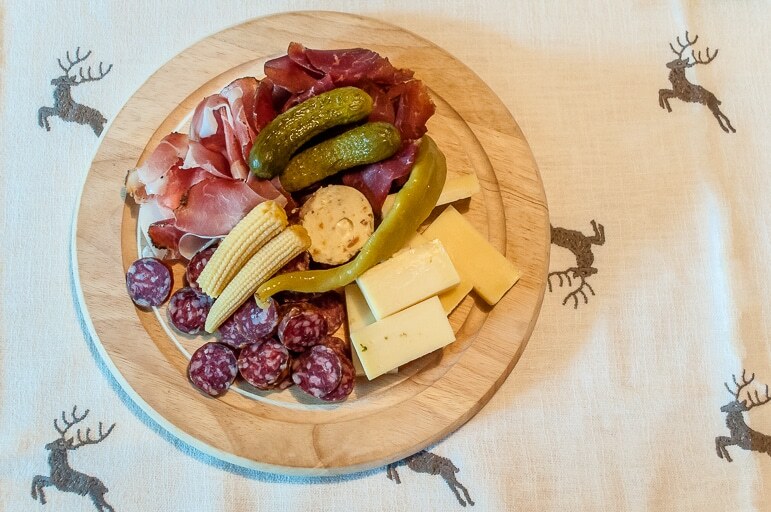 Food in Austrian hotels is usually of a high standard and the Das Central is no exception – dining choices include two dining rooms. 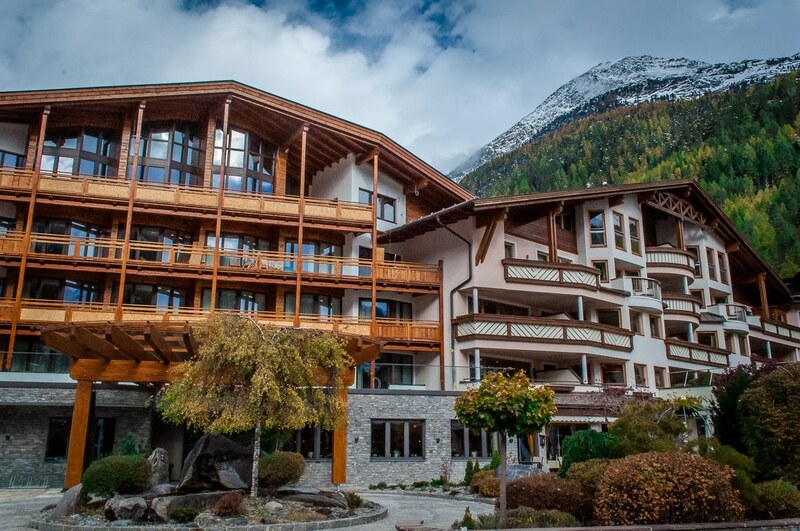 At lunchtime, there is the cosy Marend Stube, while the main gourmet restaurant, the Feinspitz is where the extensive buffet breakfast and a la carte evening meals are served. Here beautiful use is made of local wood to intricately decorate the walls and ceiling of the restaurants in a traditional alpine style, all of which set the tone for the high-quality Austrian-inspired cuisine that was served. 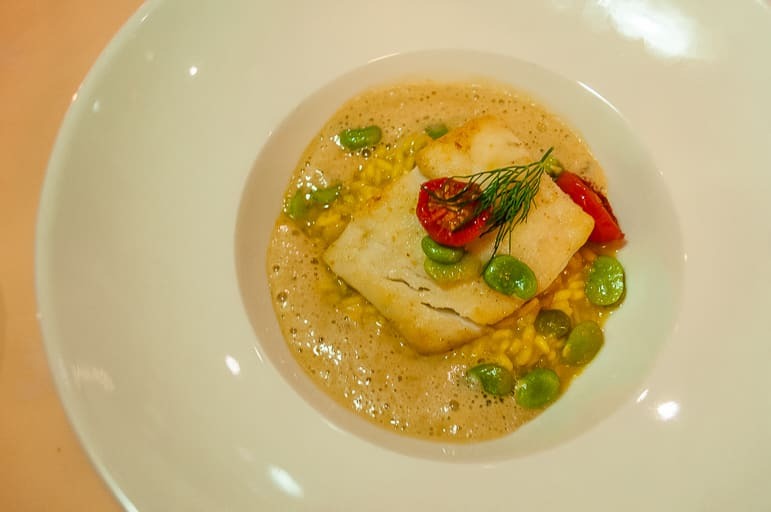 On our first evening, we dined in the Feinspitz on a menu including marinated shrimp, warm smoked wild salmon medallion, shellfish risotto and flageolet beans, and warm chocolate lava cake. We devoured each course with an accompanying white wine, Weingut Gross, and Das Central’s speciality red, Pino 3000. There is an interesting story behind the Pinot 3000, Das Central’s own blended wine which combines the best grapes from Austria, Germany and Italy. In 2011 two oak barrels of the best Pinot Noir from each of the three countries were brought together in Italy and then matured in Sölden at an altitude of 3,048 metres, on the summit of the Gaislachkogl glacier. There in the Ice Q restaurant – an architectural and gourmet delight from the same company as Das Central – is a purpose-built wine cellar where the Pino 3000 matures in even, cool temperatures. At this altitude it is unaffected by the seasons, allowing its fruitiness to develop, and local wine producers and sommeliers seem to agree that at an altitude of over 3,000 metres the wine tastes even better. 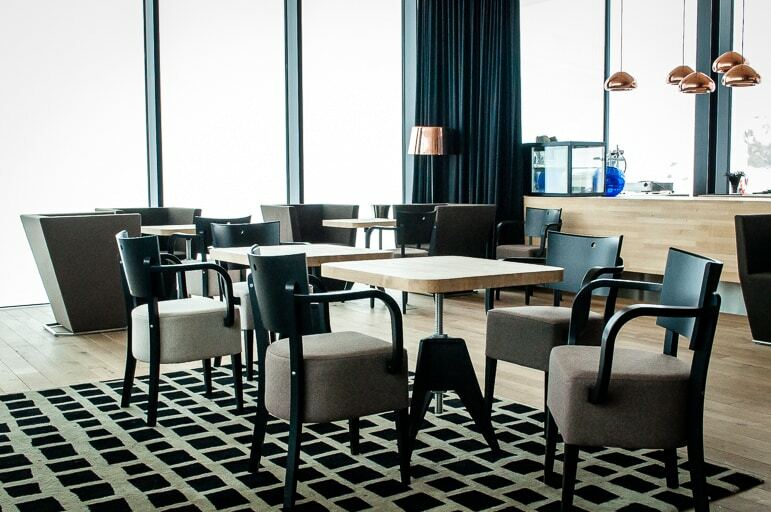 After our lavish dinner, we retired to the new hotel bar where we sampled their extensive range of schnapps. There were too many to try them all, but in the interest of providing you, dear reader, with some important information we did try five. Firstly the strangely named, Above a Stinking Well, which surprisingly given the title, went down very nicely. We then moved onto a raspberry schnapps, followed by apricot, pear, and an elsbeere one. 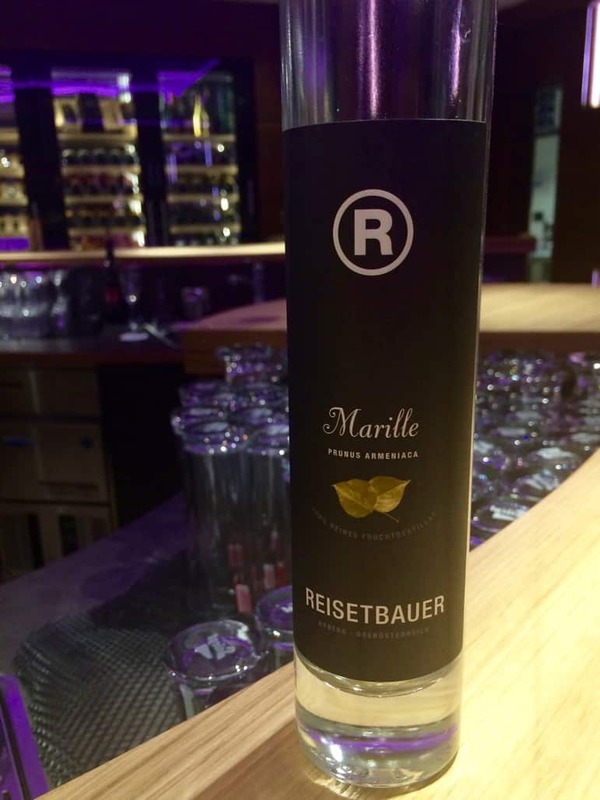 The tree that grows the elsbeere berry only produces berries worthy of the schnapps every five years, so one of Das Central’s tastiest spirits comes in at €22 a shot. Suitably refreshed we thought it sensible to head to bed before we fell over. To help kick-start our alpine day the hotel’s breakfast was an extensive gourmet feast with an array of organic egg dishes, fresh fruits, juices, breads and more. 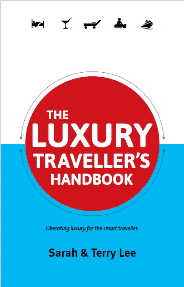 Austrian tourism’s slogan is ‘arrive and revive’, and the outstanding natural landscape as well as the spa and wellness culture found across the country makes this rather easy to do. 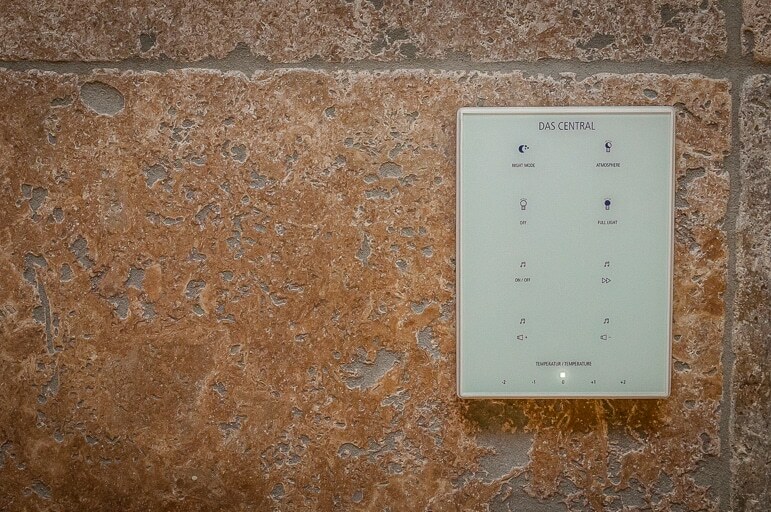 Das Central is no exception, it has a delightful Venetian themed spa and wellness centre which we made good use of. 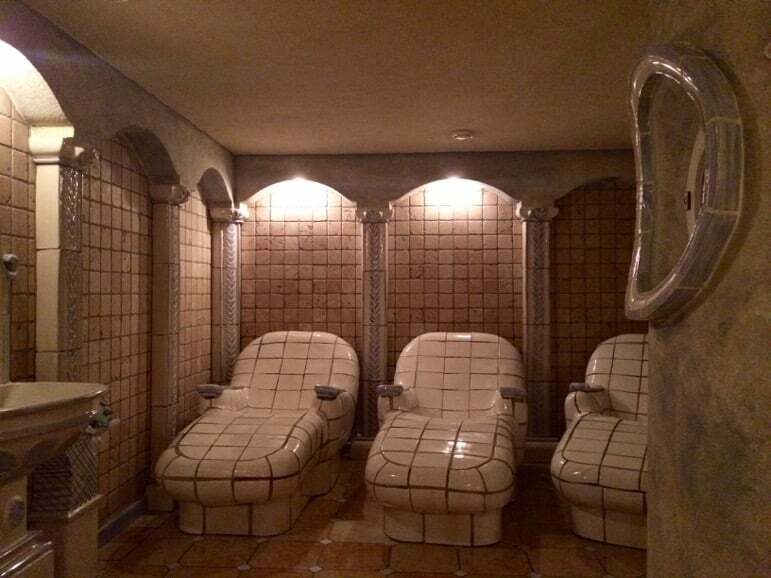 As with all Austrian spas, the saunas and steam rooms are mixed and used while naked, however, the hotel did have a separate sauna and steam rooms for those more reticent about going au naturel. 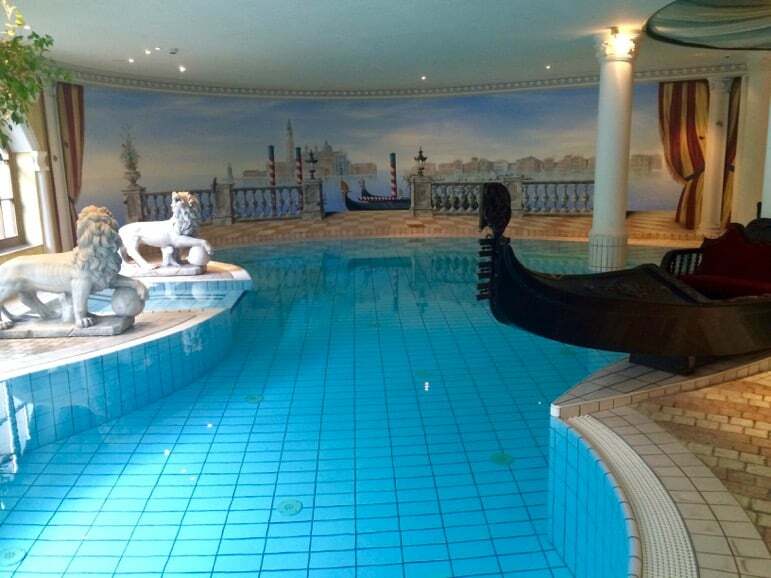 There is also a swimming pool, Jacuzzis and array of drinks, fruit and nuts available all day in the spa. 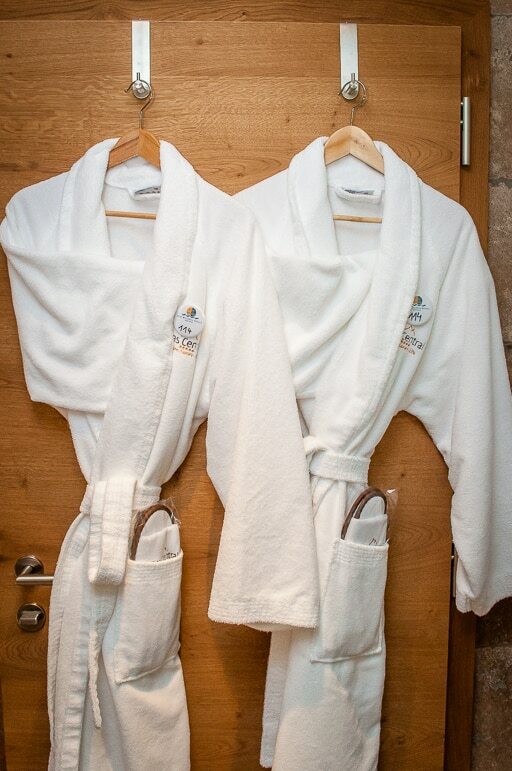 We also road tested three of the hotel’s treatments to see if they got the LiveShareTravel seal of approval, and we’re pleased to report they did. We had a couple’s Luxury Alpine treatment consisting of a full-body scrub from therapists Gudrun and Thomas, using Alpine herbs and oils. This was followed by Sarah and I getting into a herbal bath while sipping champagne and nibbling on fresh fruit. This decadent treatment was rounded off with a relaxing full-body massage using hot stones and natural oils. This was a lovely, relaxing way to finish off a hectic day of travel. The next day we returned for two more treatments Sarah had a Vinoble mini lifting facial and I had a salt crystal relaxation massage. Sarah’s mini facial involved use of Sausal Pinot Noir grape seed, grape stem cells and precious red wine extracts, to refresh and tighten the skin. She emerged refreshed, and in my eyes looking more beautiful than ever. My salt crystal massage involved salt scrub with arnica, honey and stone pine or St John’s wort and biopir before a salt stone massage using salt-crystals. My therapist Thomas was very thorough and professional, his limited English and my even more limited Austrian, meant we did little talking, but this allowed me to drift into blissful slumber. Dragging ourselves away from the luxury of the hotel we explored the area and unearthed one of Sölden’s most exciting secrets. In the summer of 2015, Sölden was a location for the latest James Bond film Spectre. Cast and crew stayed in the town while shooting there, many at Das Central hotel. And, featuring prominently in the film is the Ice Q restaurant, located high up on the Gaislachkogl glacier at 3,048 metres. We took the same gondola up the mountainside in which Q comes face to face with a Bond villain. Then we arrived at the Ice Q, which is the Hoffler clinic in the film. It has a spectacular setting and is an architectural wonder and during our visit in mid-October was already covered in snow. 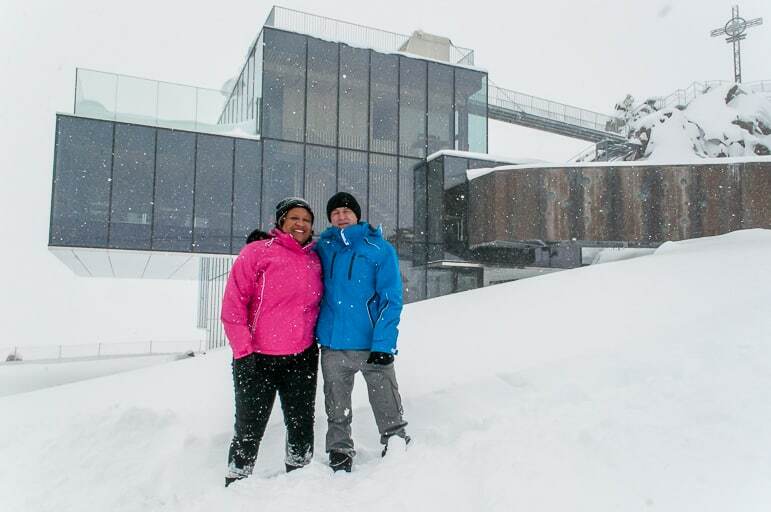 It’s also renowned for its excellent fine-dining menu prepared by chef Patrick Schnedl, but sadly during our trip, it was closed for business until the ski season started again. Later, we took the winding mountainside road that Daniel Craig’s Bond speeds along in the obligatory car chase, although this time there was an aeroplane involved as well. 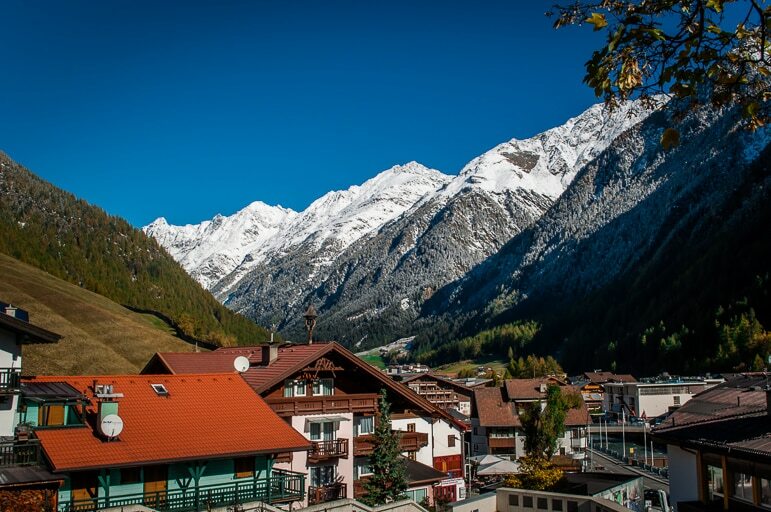 Sölden is already a popular place to visit, beloved by skiers in winter and hikers in summer and it is now set to be explored by movie lovers. But whatever your interest in the area you’d be hard pushed to find a finer place to stay during your visit than Das Central. Wow what a gorgeous looking hotel, the photos are beautiful! Wow it makes me want to head right there! I wonder what adventure activities i can get into there! Oh you’d enjoy it, David – it’s all about the skiing! But I’m sure there’s a fair few other adventures you could find year round too.